We didn't arrive in GA until 6:30 pm. after checking in and freshening up, we met my brother & his family at the pubic square. 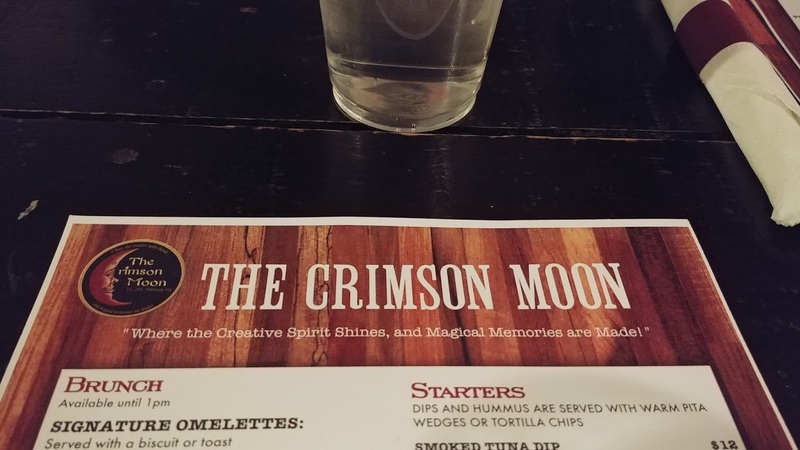 A lot of places were super crowded/busy but we managed to get a table at The Crimson Moon. Nephew was excited to finally eat since he had skipped lunch in order to be able to eat with us and still make weight for his wrestling match the next day. Niece was simply hungry. So were we. 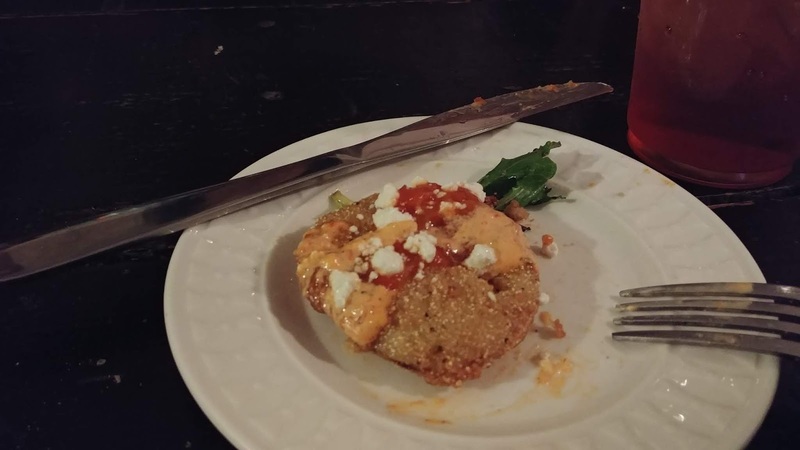 Almost Famous Tomatoes (4 fried green tomatoes topped with peach chutney, goat cheese, and roasted red pepper sauce). I was so hungry I forgot to take a photo of the entire plated dish of 4 tomatoes. I was so excited to have fried green tomatoes and these did not disappoint. Sometimes I think the green tomatoes are simply a delivery vehicle for the other components like goat cheese, red pepper sauce, chutney and at other places, bacon, grits. 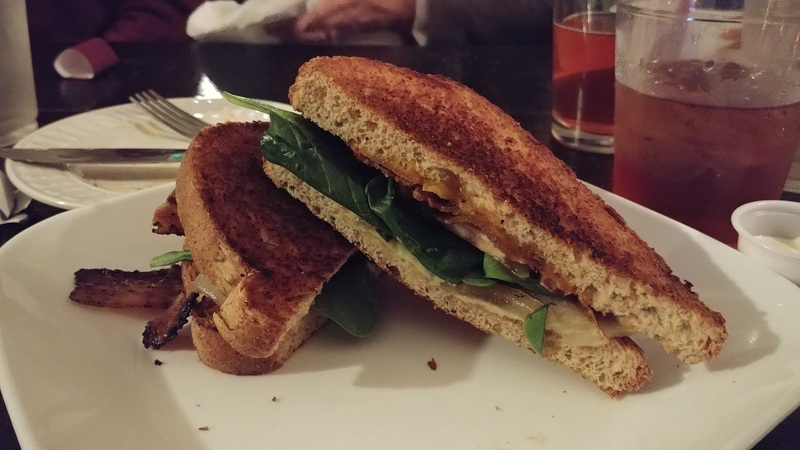 I chose Fancy Grilled Cheese (cheddar & American cheeses, spinach, caramelized onions, tomato, bacon). This was a really good grilled cheese. I was very hungry, but then I started to fill up so I ended up ripping off the crust of the bread. I've never much cared for crust! 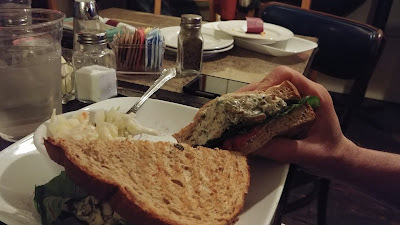 SP chose Tarragon Chicken Salad (with sliced almonds, grapes, served on hearty wheat). He really like it. I tried a bite and liked it, too. Tarragon is really great in salads like this. My brother chose Little Dive Bar Burger (American cheese, onion straws, bacon, drizzled with buffalo sauce & ranch mayo). He really liked it. Everyone kept swiping his sweet potato waffle fries so I think he got a little mad at us all! 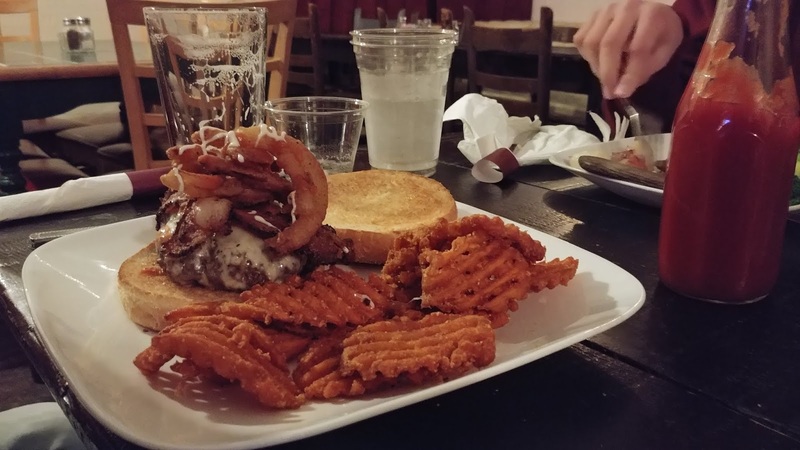 SIL and Niece had the blue cheese burger with onion straws and bacon while Nephew ate Whiskey Glazed Flat Iron Steak with roasted potatoes & broccoli. I didn't take photos because everyone was hungry and their food was across the table, not conveniently right next to me. 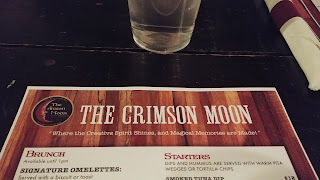 We really liked The Crimson Moon. It was very casual and relaxed. They have live music. I'm not gonna lie - I was happy the live musician(s) playing when we entered stopped playing shortly after we arrived and that made it much easier to talk and hear everyone! Our food was yummy and our server was friendly and helpful. She described beers and brought samples and kept waters filled. We'd go back the next time we visit.